There are several international studies that have compared kidney transplantation with dialysis , and numerous multi-center clinical trials of good methodological quality ,,, that agree in showing the clinical superiority of a transplant. This study presents a mathematical model that analyzes both clinical and economic impact of kidney transplantation compared with dialysis therapy in the Colombian healthcare context. We built a Markov model with monthly cycles over a five-year time horizon and from a third-party payer perspective (Colombian healthcare system) including only direct medical costs. We used the Tree Age Health Pro 2009 suite (version 1.0.2, TreeAge Software Inc.) program. The model [Figure 1] compares the decision of whether to offer transplantation or to start a chronic dialysis program in a patient without contraindication to kidney transplantation and who is on a hypothetical waiting list for a transplant. Analysis was performed with time horizons of one-, two-, threeand five-years. The five-year time horizon was considered as a reasonable upper time limit for a decision maker. The annual discount rate was 3% for both costs and outcomes as recommended by the Colombian Ministry of Health. Figure 1. General scheme of the model showing states and transitions. In the model, the term "chronic rejection" referred to the different conditions such as Interstitial Fibrosis Tubular Atrophy (IFTA) or chronic graft glomerulopathy. "Second-line" therapy represented those patients who have responded to acute rejection treatment but will experience further deterioration of renal functions (and require different medication or higher doses). The outcomes were expressed in terms of net costs, deaths averted (per 1000 patients), months of life gained, months of dialysis averted and QALYs gained with each therapy. The results were reported as an incremental cost for each outcome gained (or per death prevented or month of dialysis averted) comparing transplantation with dialysis. Utilities to estimate QALY values in each of the states were obtained from a literature review using the Tufts University database of cost-effectiveness studies. We used the mean of all studies published in indexed journals that included utility calculation, as shown in [Table 1]. Table 1: Utilities used in the model. All costs were expressed in 2012 US dollars at the average exchange rate of 1,798 Colombian pesos per US dollar. To estimate costs, we used different sources [Table 2] and [Table 3].Monthly HD and PD package costs were obtained from a weighted average of current market price. This monthly package includes vascular access, medical and nursing care as well as basic medications. To estimate the costs of complications, we used four studies: Loza-Concha et al  who estimated total costs both for the surgical procedure as well as for the 5-year follow-up of a group of 58 patients who underwent renal transplantation in Peru; Blotière et al  and Benain et al,  who analyzed the databases of ESRD patients (27,348 transplanted, 2,566 on PD and 30,945 on HD) in France; and Arrieta  who estimated the direct costs of the complications of the three different therapies in Spain. Based on these studies, we estimated that the average cost of a complication is equivalent to a percentage of the monthly cost for each of the therapies: For HD, the average monthly cost for complications was 26.1% of the monthly cost of a "dialysis package"; for PD, it was 69.7%; and for a transplant, it was 13% of the immunosuppression cost. Table 2: Main costs included in the model (in 2012 US dollars). Table 3: Medication costs (in US dollars). A univariate sensitivity analysis (Tornado diagram), a multivariate analysis and a Monte Carlo simulation were performed where all variables were changed simultaneously according to pre-defined distributions [Table 1] and [Table 2]. Distributions were assigned according to the characteristics of each variable, gamma distribution was used for grouped costs, beta distribution was used for mortality rate and utilities and uniform distribution was used for effectiveness variables using limits for the confidence interval reported as the minimum and maximum values. The average discounted total costs for transplantation and dialysis therapy were USD$76,718 and USD $76,891, respectively [Table 4]. The costs of dialysis were reduced in part due to increased mortality; the average cost was USD $91,440, considering only patients who survived having the same rate as the transplanted patients. The net cost-utility of the transplant was dominant over the time limit of five years. The cost of one-year transplantation and dialysis was USD 33,108 and USD 21,488, with 0.76 and 0.59 QALY, respectively. Transplantation became the dominant alternative after the fourth year and was a cost-effective alternative from the second year with an incremental costeffectiveness ratio of USD 11,788 (for a cost difference of $6.2 million and a QALY gain of 0.29). The univariate sensitivity analysis showed that there were two critical variables in the model. The first one was the monthly cost of immunosuppression; transplantation would stop being a cost-saving alternative if the average monthly cost of immunosuppression was greater than USD 556. The second critical variable was the monthly cost of dialysis; Given the current distribution between PD and HD, if the monthly cost of dialysis was reduced to USD 1,112 (from its current cost of around USD 1,300), then transplantation would reach the GDP per capita threshold and the average monthly cost of dialysis would have to be lowered to USD 956 for transplantation to reach the threshold of three times the GDP per capita. On the other hand, transplantation was always a more effective option and it produced a higher utility in QALY than dialysis within the established ranges, regardless of changes in any of the model's variables. When performing analysis on the net costeffectiveness ratio, we found that even at USD 27,800 per procedure (compared with the current cost of around USD 18,000), a transplant would still be the best alternative in terms of cost-effectiveness and cost per QALY when compared with dialysis therapy. The transplant would continue being more cost-effective even if the cost of immunosuppression reaches up to USD 1,560 per month. To reach the same cost-effectiveness ratios, the monthly cost of PD and HD must be less than USD 950 and USD 670, respectively. When performing the probabilistic sensitivity analysis, for a threshold of three times GDP per capita, transplantation was more costeffective than dialysis in 76% of the trials. This study has various limitations, such as the value assigned to the cost of the complications for each of the therapies, which have been taken from the different international sources due to the lack of the standardized national registries. As with any model, some assumptions have been made, such as the patients were middle-aged (the results would be different for the elderly or a child), the donors were deceased and the costs and the efficacies of immunosuppressive therapies were both averaged, while the heterogeneity of the renal transplant patients was ignored to some extent. The most important result of this study was that even with a relatively short time limit, transplantation was a better option in terms of cost-effectiveness than dialysis, especially when considering the net value of cost per QALY. If the time limits were extended or indirect costs or expenses were considered, the result would surely be even more favorable. Although survival rate and patient quality of life for dialysis has improved over the last few decades, , advances in transplantation have reduced graft loss, particularly when it comes from a living donor and when transplantation is performed early. In the short to medium term, the reduction of cost of immunosuppressive drugs is expected due to more competitive market and expiration of patents of most commonly used medications. We conclude that health systems that value both overall survival as well as quality of life and would like to invest in interventions with an adequate margin of cost-effectiveness should support programs that encourage renal transplantation over dialysis for patients with ESRD. This study received economic support from Pfizer Colombia and collaboration from the Colombian Association of Organ Transplants. The concepts expressed, however, are the responsibility of the authors. Machnicki G. Economics of transplantation: A review of the literature. Transplant Rev 2006; 20:75. Gómez RA. Renal disease in Colombia. Ren Fail 2006;28:643-7. Woodroffe R, Yao GL, Meads C, et al. Clinical and cost-effectiveness of newer immunosuppressive regimens in renal transplantation: A systematic review and modelling study. Health Technol Assess 2005;9:1-179, iii. Abboud H, Henrich WL. Clinical practice. Stage IV chronic kidney disease. N Engl J Med 2010; 362:56-65. Prabahar MR, Chandrasekaran V, Soundararajan P. Epidemic of chronic kidney disease in India what can be done? Saudi J Kidney Dis Transpl 2008;19:847-53. Rosselli D, DeAntonio R, Calderon C. Costeffectiveness of a renal health program for patients with diabetic and/or hypertensive chronic kidney disease. Hospitalaria 2009;62:12-8. Rosselli D, DeAntonio R, Calderon C. Economic analysis of peritoneal dialysis compared with hemodialysis in patients with chronic, diabetic or hypertensive renal disease. Med Unab 2008;11:201-5. 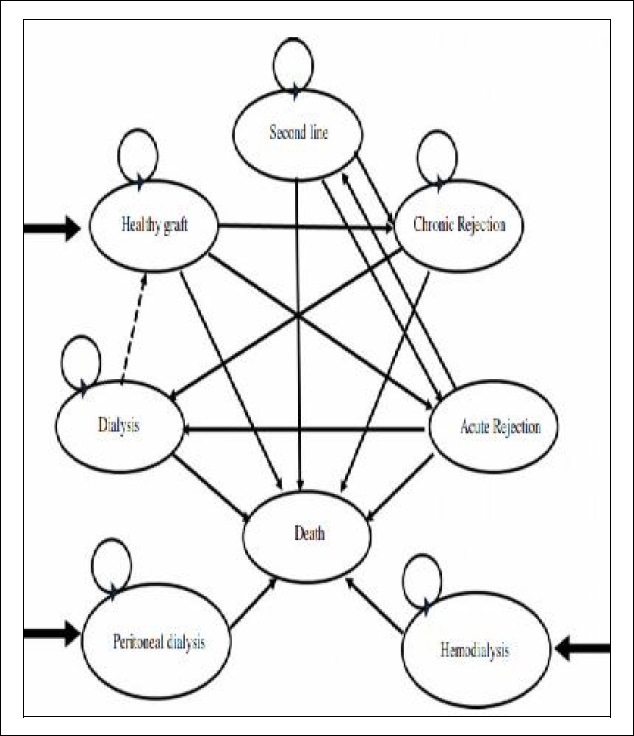 Bayoumi M, Al Harbi A, Al Suwaida A, Al Ghonaim M, Al Wakeel J, Mishkiry A. Predictors of quality of life in hemodialysis patients. Saudi J Kidney Dis Transpl 2013;24:254-9. Wyld M, Morton RL, Hayen A, Howard K, Webster AC. A systematic review and meta-analysis of utility-based quality of life in chronic kidney disease treatments. PLoS Med 2012;9: e1001307. Thomas R, Kanso A, Sedor JR. Chronic kidney disease and its complications. Prim Care 2008; 35:329-44, vii. Lee CP, Chertow GM, Zenios SA. An empiric estimate of the value of life: Updating the renal dialysis cost-effectiveness standard. Value Health 2009;12:80-7. Grosse SD. Assessing cost-effectiveness in healthcare: History of the $50,000 per QALY threshold. Expert Rev Pharmacoecon Outcomes Res 2008;8:165-78. Dor A, Pauly MV, Eichleay MA, Held PJ. Endstage renal disease and economic incentives: The International Study of Health Care Organization and Financing (ISHCOF). Int J Health Care Finance Econ 2007;7:73-111. Pecoits-Filho R, Campos C, Cerdas-Calderon M, et al. Policies and health care financing issues for dialysis in Latin America: Extracts from the roundtable discussion on the economics of dialysis and chronic kidney disease. Perit Dial Int 2009;29 Suppl 2:S222-6. Ekberg H, Tedesco-Silva H, Demirbas A, et al. Reduced exposure to calcineurin inhibitors in renal transplantation. N Engl J Med 2007;357: 2562-75. Laftavi MR, Stephan R, Stefanick B, et al. Randomized prospective trial of early steroid withdrawal compared with low-dose steroids in renal transplant recipients using serial protocol biopsies to assess efficacy and safety. Surgery 2005;137:364-71. Remuzzi G, Cravedi P, Perna A, et al. Longterm outcome of renal transplantation from older donors. N Engl J Med 2006;354:343-52. Remuzzi G, Lesti M, Gotti E, et al. Mycophenolate mofetil versus azathioprine for preven-tion of acute rejection in renal transplantation (MYSS): A randomised trial. Lancet 2004;364: 503-12. Danovitch G, Savransky E. Challenges in the counseling and management of older kidney transplant candidates. Am J Kidney Dis 2006; 47:S86-97. Sanabria M, Muñoz J, Trillos C, et al. Dialysis outcomes in Colombia (DOC) study: A comparison of patient survival on peritoneal dialysis vs. hemodialysis in Colombia. Kidney Int 2008; 73:S165-72. Lamb KE, Lodhi S, Meier-Kriesche HU. Longterm renal allograft survival in the United States: A critical reappraisal. Am J Transplant 2011;11: 450-62. Collaborative Transplant Study, University of Heidelberg Department of Transplantation Immunology. Available from: http://www.ctstransplant.org/. [Last accessed on 2013 Mar 14]. Fenton SS, Schaubel DE, Desmeules M, et al. Hemodialysis versus peritoneal dialysis: A comparison of adjusted mortality rates. Am J Kidney Dis 1997;30:334-42. Costo CD. Chronic Kidney Disease in Colombia; 2011. Available from: http://www.cuentadealtocosto.org/byblos/Docs/Libro%20Enfermedad%20Renal%202011.pdf. [Last accessed on 2013 Mar 06]. Tufts CEA Registry. Available from: http://www.research.tufts-nemc.org/cear4/default.aspx. [Last accessed on 2013 Dec 14]. Loza-Concha RE, Quispe AM. Cost utility of renal transplant vs. hemodialysis in the treatment of end stage chronic kidney failure in a Peruvian hospital. Rev Peru Med Exp Salud Publica 2011;28:432-9. Blotière PO, Tuppin P, Weill A, Ricordeau P, Allemand H. The cost of dialysis and kidney transplantation in France in 2007, impact of an increase of peritoneal dialysis and transplantation. Nephrol Ther 2010;6:240-7. Benain JP, Faller B, Briat C, et al. Cost of dialysis in France. Nephrol Ther 2007;3:96-106. Arrieta J. Economic evaluation of renal replacement therapy (hemodialysis, peritoneal dialysis and transplantation) in Spain. Nephrology 2010; 1:37-47. Landreneau K, Lee K, Landreneau MD. Quality of life in patients undergoing hemodialysis and renal transplantation - A meta-analytic review. Nephrol Nurs J 2010;37:37-44. Asolati M, Matas AJ. Risks versus benefits of living kidney donation. Curr Opin Organ Transplant 2003;8:155-9.